I DRINK BEER AND WRITE ABOUT IT. There are very few beer events that coincide with special days in the “real world”. The one exception to this rule is the Black Friday release Goose Island Bourbon County Brand Stout and its four variations. You may remember that we wrote about Bourbon County last year as it was the first time that this historically coveted beer had been “officially” distributed to California. As Black Friday approaches, I’ve done the very difficult work of trying this year’s batch and gathering all the info on where you can find some to try yourself. 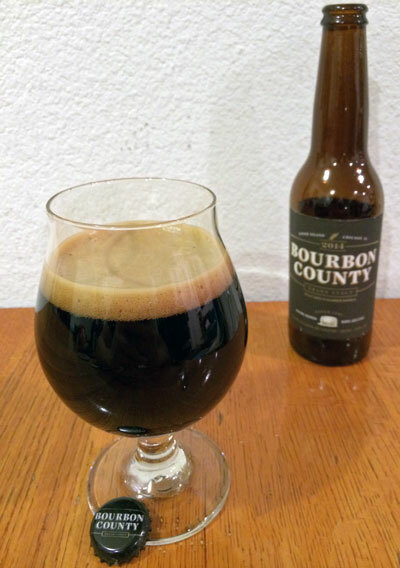 For those just tuning in, Bourbon County Brand Stout (BCS for short) is an imperial stout that is aged in bourbon barrels for roughly six months. It has been delighting craft beer fans since 1992, though brewmaster Brett Porter says that the first batch was not exactly heralded as the masterpiece of brewing we think of today, but has evolved over the years to its current high water mark. For many years, Goose Island brews did not make it out of the Midwest, with the main reason being the production output of their Chicago brewery. This changed in 2010 when Anheuser-Busch purchased a majority share of Goose Island, effectively buying out the company. Since then, Goose Island has been able to dedicate their main brewing facility in Chicago to exclusively brewing and barrel aging their Vintage and Bourbon County lines of beers. As a result, you can now find Goose Island beer in almost every state, including their rarest offerings like Bourbon County Stout. This year they will be releasing five beers in the Bourbon County series, but sadly you will only be able to get four of them here in California as the fifth is only released in Chicago as a thank you to their local fans. Beyond its namesake, this year will see the return of Bourbon County Brand Coffee Stout that was made with Rwandan Zirikana coffee from Intelligentsia this year, Bourbon County Vanilla Rye that last saw release in 2010, and Bourbon County Brand Barleywine Ale. This year’s Proprietor’s Bourbon County Brand Stout was made with cassia bark from Vietnam, cocoa nibs from the Congo, coconut water from Thailand, and Mexican panela sugar creating a “Mexican hot chocolate” Bourbon County Stout. Sadly, this variation will only be sold in the Chicago area, so start working those relatives and bottle trading contacts. This year’s Bourbon County Brand Stout clocks in at 14.4% ABV and holds up nicely with the legacy this beer has created. The beer pours a deep black color with a small amount of mocha colored head that quickly dissipates to a pleasant ring around the glass. The aroma, as you would suspect, has a distinctive bourbon character that is complimented by cherry, dark chocolate, and vanilla with a hint of smokiness. The mouthfeel falls between medium and full body with a very mild carbonation that still lends itself to a creamy texture. This year’s release seems to be a slightly thinner that the 2013 release, but not so much as to detract from the experience. The flavor holds closely with the aroma, presenting your palate with a mixture of cherry, vanilla, and oak from the bourbon barrels that mingles with the slightly smoky, bitter chocolate notes from the roasted malts. The finish is fairly dry and has a distinctly bourbon aftertaste with hints of vanilla and oak that gives way to a lingering cacao bitterness. This beer is wholly deserving of its 100 rating on Beer Advocate and is definitely a must try for any craft beer fan that enjoys a good barrel aged stout. Note: The brewers of this beer recommend enjoying it at a temperature above 50 degrees, much like a fine wine or whiskey, to best experience the full range of flavors. For those of you who were able to try last year’s release, you will definitely see some key differences, specifically in the mouthfeel and the amount of sweetness and booziness. The reason for this is not due to a change in recipe or brewing technique, but in the barrels and the weather. The most obvious reason for variations from year to year would have to be the fact that bourbon barrels are not all identical. Each one can possess variations in quite a few aspects that impart different things to the beer, such as more oak or vanilla character. The other factor is that Goose Island lets their Bourbon County barrels fend for themselves in the ambient indoor temperatures of Chicago’s weather, which pretty much guarantees that every year will produce different nuances from the amount of warm and cold periods that the barrels experience. Brewmaster Brett Porter says they have no plans on changing this aspect of how they make BCS, which is yet another reason for the craft beer community to think about the effects of climate change. Sadly at the time of writing I was not able to taste this year’s Coffee Stout, Barleywine, or Vanilla Rye. Though I hope to post some updates if I am able to secure any of this year’s other releases. They will be pouring 2014 Bourbon County Stout and Barleywine, 2013 Bourbon County Stout, and a number of other Goose Island beers. The event starts at 5pm. They will be pouring the full lineup of 2014 and 2013 Bourbon County beers as well as some other special Goose Island beers. The event starts at 7pm. For those looking to purchase bottles this is going to be the place to be. Ramirez Liquor has been tapped as the official Black Friday release location for LA and will not only have the beers for sale, but also custom Goose Island gifts to the first 200 beer fans in line according to Goose Island’s PR release (though a commenter has stated that the gifts will only be for the first 50 people) and offerings from Donut Friend and Klatch Coffee for those in attendance. LA did not have a proper Black Friday release of Bourbon County last year, so there is no saying how crazy things will get. The store will open at 9am so plan your arrival accordingly. They will be pouring the full line of 2014 Bourbon County beers and a number of other Goose Island beers. They also promise “several goose-inspired dishes to cleanse the palate.” The event starts at 5pm. 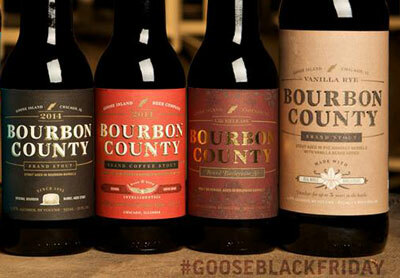 For those with a more adventurous streak, bottles of Bourbon County should start hitting the LA market this week. 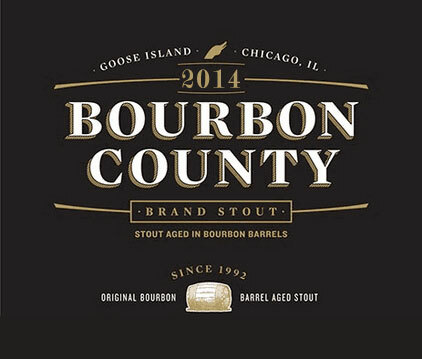 Most bottle shops and liquor stores that carry Goose Islands other barrel aged and sour beers should be getting some Bourbon County Stout, with the more select stores getting the full lineup. Though Goose Island wants these beers to be released on Black Friday, some retailers have been known to start selling them prior to the official release. If you really want a specific version I’d recommend keeping an eye on your favorite beer buying destination’s social media or give them a call and ask politely about the availability. This entry was posted in Read'em And Weep. Bookmark the permalink. Some mis-information here. There will not be gifts for the first 200 people, more like the first 50, also the store is opening at 9am not 7. Cheers. Thanks for the heads up! I’ve updated the info above. Thanks Jeff, hope to see you there!! Sadly I’ll be out of town all week, but hopefully the event goes well!